According to a survey conducted by a real estate information service “at home” in November 2009, the average commute time for married salary-men between twenties to fifties who work in Tokyo was 60 minutes. The survey also indicates that about 67% of them take train for commuting to work. Meanwhile, a research conducted by a facility management company “Regus” on 11,000 businesses in 13 countries showed the top country with the longest average commute time was China and the time was 42 minutes. The research was conducted in September and August of 2009, and Japan was not included. 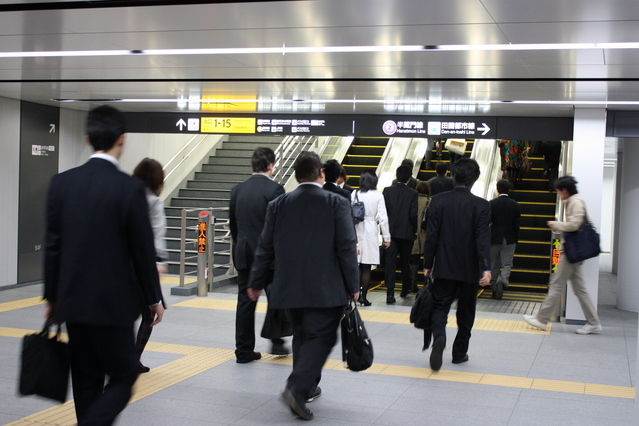 But compare to China’s 42 minutes, you can see that the salary-men in Tokyo spend quite long time for commuting. Say, they work 250 days a year, they spend about 21 days for commuting per year! Those who spend 45 minutes in train a day, spend 16 days in train per year. That is why, train commuters try to make good use of their commute time by reading books, listening English study aid, or taking nap.